Just in time for beach bags everywhere, Disney-Hyperion is hosting a Goodreads giveaway of SUMMER OF SLOANE! Up for grabs: ten paperback copies -- plus, I'll throw in a signed bookplate and bookmark for all winners! Copies are courteous of Disney-Hyperion and will ship directly from the publisher -- giveaway is open to US residents only. Contest runs Monday, June 12th through Monday, July 10th! Link to enter is below (FYI, it won't be active until Monday, 6/12) -- good luck to all! Giveaway ends July 10, 2017. After more than eight long years, a couple hundred rejection letters, two agents, two editors, and too many sleepless nights to count, I cannot believe SUMMER OF SLOANE is finally here. This truly has been one of the most surreal moments in my life and sometimes I can't believe I actually wrote a real book. But before I break down into a blubbering mess, I'd just like to say thank you to all of my CP's, every single blogger, librarian, book seller, and all of my friends - both new and old - that have tagged along for this crazy ride -- your support means the world to me. And in the off chance anyone would like to purchase an autographed copy of SLOANE, University Bookstore here in Seattle has them available to order and ready to ship worldwide! For more information, please go here. 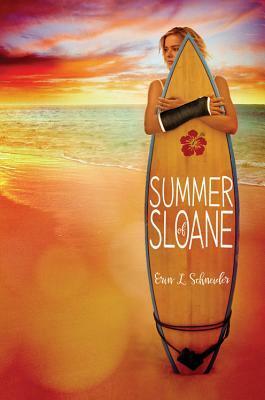 Welcome to the world, SUMMER OF SLOANE -- I'm so happy you're finally here! After all these years, the day is finally here! Thank you so much to everyone who's stood by my side over the long road to publication, cheered me on, and supported me when I needed it the most...just, thank you. Tagged: Book Birthday, Publication Date, WHERE THE WATER FALLS, Happy Birthday! Holy WOW -- this couldn't have been a closer competition! It literally came down to the wire, with the tie-breaking vote coming in 4 minutes before I closed the contest! Since the votes were so, so close, BOTH winners will be receiving a signed hard cover copy of SUMMER OF SLOANE, along with some cool swag -- I hope you don't mind the upgrade, Carolina!!! 1st Place: #7 Bea | Namsan Tower, South Korea with 34 votes. 2nd Place: #12 Carolina | Caldas da Rainha, Portugal with 33 votes. 5th Place: #2 Kim | North Sea, Sylt, Germany with 12 votes. 6th Place: #9 Lauren | Disneyland, California with 10 votes. No matter if you got 34 votes or zero, THANK YOU SO MUCH to everyone who entered and took the time to take SLOANE around your part of the world -- I loved seeing it all!!! And congratulations to both Bea and Carolina -- I'll pack up your boxes shortly and get them out to you asap! We're down to my last favorite line and I can't believe SLOANE will be out in the real wide world next Tuesday! Thank you so much for joining me over the past twelve weeks (and months and years before that! ), cheering me on, and for all of your support -- I hope you've enjoyed getting a glimpse into SUMMER OF SLOANE! #SLOANEAroundTheWorld Part Deux: Vote For Your Favorite Photo! The following are the final images entered into the #SLOANEAroundTheWorld Part Deux contest via Twitter and Instagram. Note: all images were pulled exactly as they were posted and I have not, in any way, altered them for this post. Take a look at all of the pictures entered -- they're numbered 1 - 14. Pick whichever photo you like the best and leave the corresponding number to that picture in the comments below. Please only vote once / for one picture. All contestants are allowed to vote, even for themselves! Voting is open from April 22 - 28th -- any votes after 11:59pm PST on 4/28 will not be counted. Winners will be announced here on Friday, 4/29! Best of luck to everyone who entered a photo -- I absolutely love seeing all the places SLOANE has been able to go! READ THE FIRST CHAPTER OF SUMMER OF SLOANE FOR FREE! Limited time only: read the first chapter of Summer of Sloane when you sign up for my mailing list for FREE! You'll also get regular updates from me. Use the form below to sign up!